There’s no doubt that wedding day is one of the most important days of one’s life. Friends, relatives, and family members witness the beginning of a new couple and a new family. Photos and videos recorded on wedding ceremony would keep happy moments for future review. For a safer keeping of wedding photos and wedding videos, many people would prefer to make a wedding DVD disc with these photos and videos. By burning wedding photos and videos to DVD disc, they could store wedding happiness in a safer way, share them with friends more conveniently, and play back on DVD player or TV easier. If you’re one of them, you’ve come to the right place. This guide shows you how to burn wedding video to DVD disc, and create wedding DVD photo slideshow with photos taken on your wedding ceremony. Several things are necessary for you to burn wedding videos and photos to DVD disc. One of the most important thing is a proper DVD burner software program. 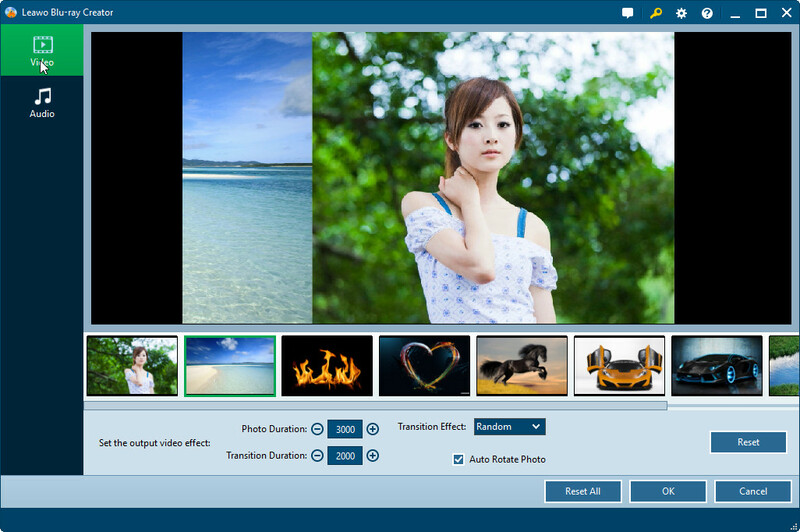 The recommended DVD burner is Leawo Blu-ray Creator. With this DVD burner, you can turn your wedding videos into eye-catching DVD movies to keep your memorable wedding moments. It can convert wedding videos in regular formats like AVI, MP4, WMV, MOV, FLV, MTS, etc. to playable DVD disc, folder and/or ISO image file. 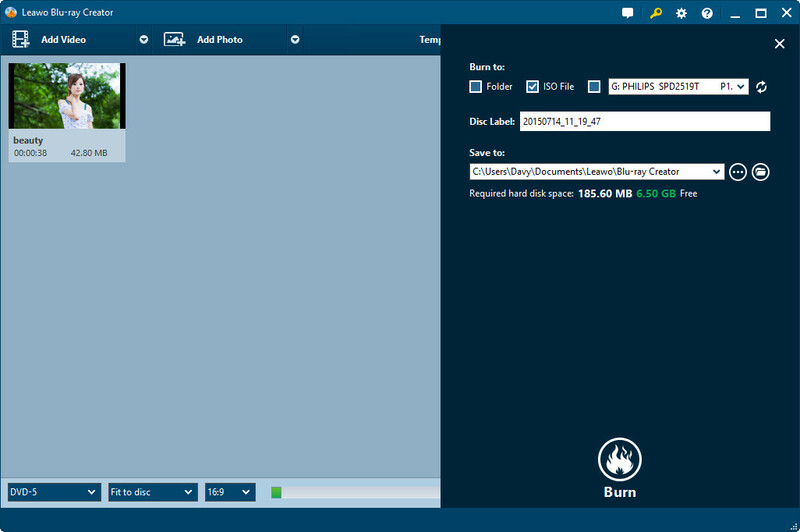 No matter you want to convert wedding video to DVD disc, or burn wedding photos to DVD photo slideshow, this Blu-ray burning software meets your needs well. Furthermore, a video editor is provided for you to personalize and polish up your wedding videos and photos. – Add disc menu to Blu-ray/DVD disc, even design disc menu with personal preferrences. 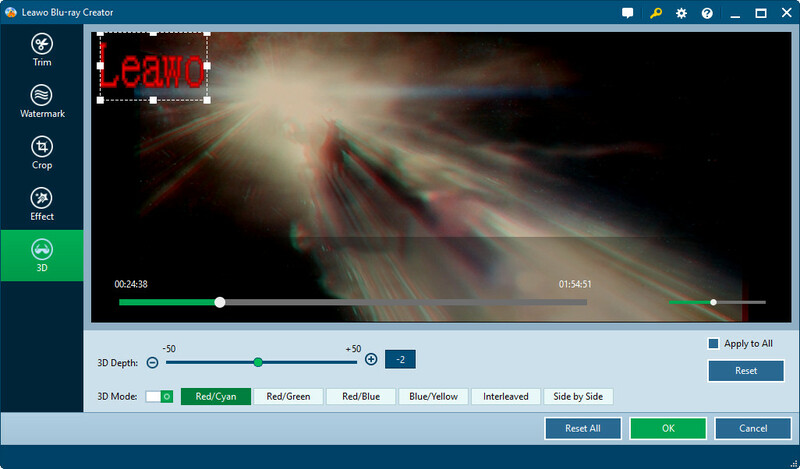 Start Leawo Blu-ray Creator on your computer. Download and install the program first via the links provided above. Put a writable blank DVD disc into the DVD disc recorder drive. Make sure source wedding photos or wedding videos are already on your computer. With Leawo Blu-ray Creator, you could easily burn wedding video to DVD disc. Get your wedding videos onto your computer, and then launch this DVD burner. You could then follow the below steps to learn how to burn wedding video to DVD disc in details. Insert a blank writable DVD disc into the DVD recorder drive. Click on the "Add Video" icon to browse and load wedding videos to this DVD burner. You could also directly drag and drop wedding video or wedding video folder for burning to DVD disc. After loading, set output disc type (DVD-9 or DVD-5), bit rate and aspect ratio at the bottom. Via right-click, you could select "Edit" option to enter the video editing panel, where you could "Trim" video length, apply image or text "Watermark", "Crop" video size, rotate photo slideshow for a special angle of view, adjust video "Effect", add "3D" effect, etc. You could also directly click the big "Edit" icon in each loaded video title to enter the video editing panel. On the right side of this Blu-ray Creator, you could choose a disc menu for your output wedding DVD. You could preview selected disc menu template by clicking the middle of it. 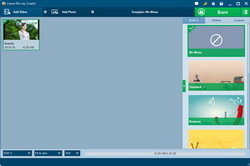 What’s more, on the preview panel, you could click the pencil icon to edit selected disc menu: add background music/image/video, change text color/size/font, adjust title content and position, etc. If you don’t want to add disc menu to output DVD disc, you could directly choose "No Menu" option on the right sidebar of the main interface. 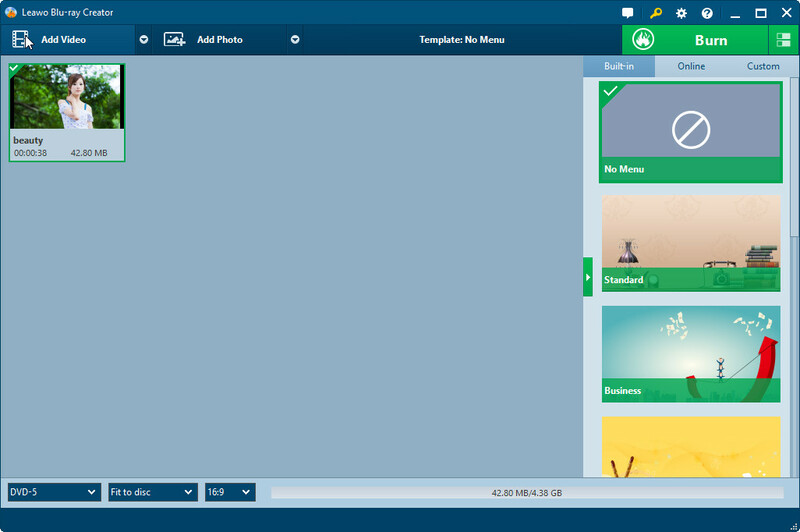 You could download more disc menu templates by clicking the "Online" button from Leawo’s online database. Edited disc menu would be saved into the "Custom" group for future use. Click the big green "Burn" button on the top right corner to invoke more burning settings, including Burn to, Disc Label, Save to, etc. Choose disc recorder drive under the "Burn to" option since you need to burn wedding video to DVD disc. Burning Engine and TV Standard are adjustable by clicking the the wheel icon on the top-right corner to open the "Burn" tab. 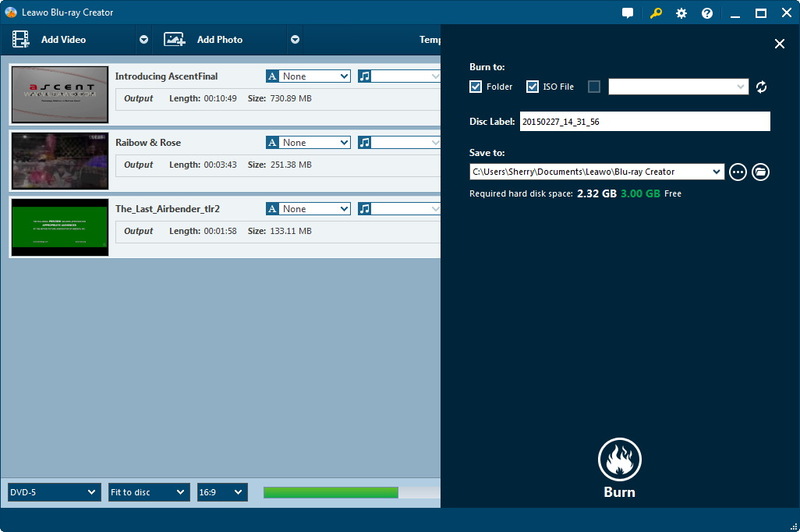 "Burn to" option allows multiple choices, which means that you could choose to create an ISO image file while burning video to Blu-ray/DVD disc as a complete copy of output Blu-ray/DVD disc for saving on your computer hard drive. It requires enough storage space. Since you want to burn zombie survival camp videos to DVD disc, select disc recorder drive in which you’ve inserted a blank writable DVD disc as target under the "Burn to" option. Finally, click "Burn" button on the burning setting panel. This DVD burner would start to burn wedding video to DVD disc immediately. Leawo Blu-ray Creator is not only a wedding video to DVD burner, but also a wedding DVD photo slideshow maker to help you burn wedding photos to DVD disc. As long as your wedding photos are saved in JPG, PNG, BMP or JPEG format, the below DVD burner guidance tells you how to convert and burn wedding photos to DVD disc in details. 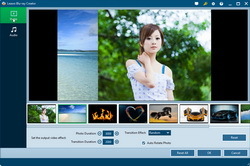 Click "Add Photos" button to browse and add wedding photos into this wedding DVD photo slideshow maker software. Loaded wedding photos would be automatically generated into photo slideshow. To burn wedding photo to DVD disc, insert a blank writable DVD disc into the disc recorder drive beforehand. Set output disc type, aspect ratio and bit rate at the bottom after loading wedding photos. The output disc type should be in accordance with the disc you’ve inserted into the DVD disc recorder drive. Right click the generated photo slideshow on the processing panel and then select "Edit" option, or directly click the "Edit" icon in generated photo slideshow title to enter the photo slideshow editing panel. You could then add external photos, remove/adjust existing photos, set photo transition and transition effect, add fovarite song as background music, set background music effect, etc. Add wedding DVD disc with desired disc menu from the right sidebar. Various themes of disc menu templates are available for choosing. Click the middle eye-shaped icon of selected disc menu to preview. On the menu preview panel, click the pencil-icon to edit disc menu and save edited disc menu to "Custom" group for future use. If you don’t want to add disc menu to output DVD disc, check "No Menu" option on the right sidebar of the main interface. 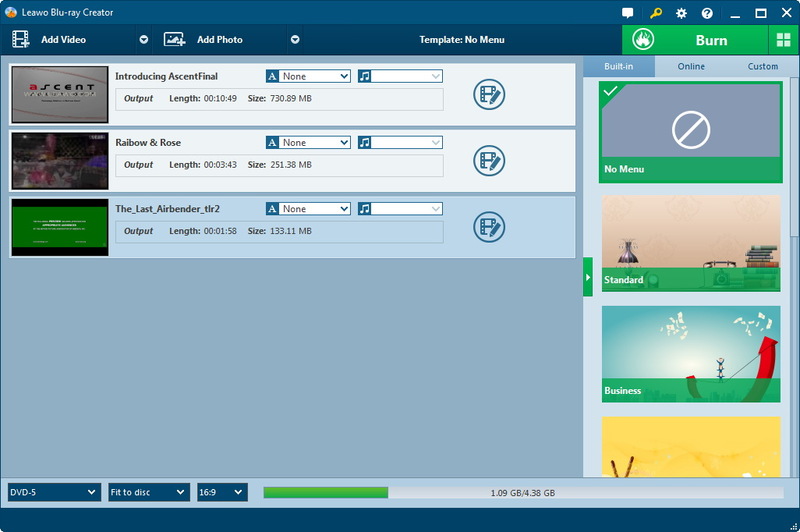 On the disc menu editing panel, you could add background music/image/video, rename titles, adjust the title position and content, text font, size and color, etc. With disc menu setting done, click big green "Burn" button to carry out more wedding DVD photo slideshow burning settings: "Burn to", "Disc Label" and "Save to". Since you need to burn wedding photso to DVD disc, insert a blank writable DVD disc into the DVD recorder drive and then set it as target under the "Burn to" option. After setting, click the bottom "Burn" button to start burning wedding photos to DVD disc. "Burn to" option allows multiple choices. You could create an ISO image file or folder of wedding DVD photo slideshow during burning wedding photos to DVD disc. The wedding DVD burning panel shows you the burning progress. You could set after-burn settings. Deciding the songs for your wedding day can be tough and stressful. Luckily, you have some suggestions here. The below 50 wedding songs are carefully selected for a wonderful wedding ceremony for dance, entrance, reception, cocktail time, etc. Make sure you’ve select the right song for the right occasion.